Froggarts Cottage Garden: Weekend in the garden. It's been a beautiful, warm and sunny weekend so I abandoned any desk-work and went out and pottered. I planted up 4 large tubs with 2 potatoes each and covered them with 6 inches of compost. As the shoots appear I'll cover up a little more until the whole pot is full. This encourages more potatoes to form from the roots at each level. I used Santes saved from last year's crop. Last year's harvest wasn't very good because of the dry weather and they didn't keep well because it has been a warm winter. The potatoes left in store in the garage are already sprouting and aren't much good to eat so they may as well start off the new season's crop. May do some more in compost bags if I have time. 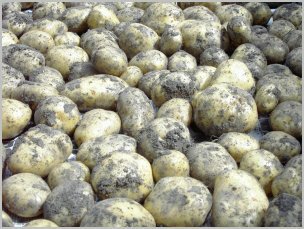 It'll provide some nice new potatoes well before the main crop and in pots they tend to be clean and pest-free. The weathermen are forecasting continued drought - dire warnings about hosepipe bans etc. It certainly is a big problem with the water table very low. The stream in the neighbouring filed is just a trickle. I suspect lack of water might have contributed to the demise of our Dawn Redwood which needs a lot of water. I did a lot of tidying, dead-heading and pruning. The fern garden was overrun with spurge which was hiding the smaller ferns and snowdrops and helibores. I cleared out a lot of the spurge and also some bracken than had taken hold there. The last job was to pick some sprouts to eat with the roast chicken for Sunday dinner and pulled the first rhubarb. The stems were only about 6ins but I could resist no longer. Delicious just baked with a sprinkling of sugar, served with custard and cream!